Bottle-conditioned ales brewed in East Alstead, New Hampshire. Below is a list of current offerings from our own wood-fired brewery in East Alstead, New Hampshire! HEMLOCK STOUT: A dark, robust cream stout flavored with the addition of NH hemlock tree tips. NEW! 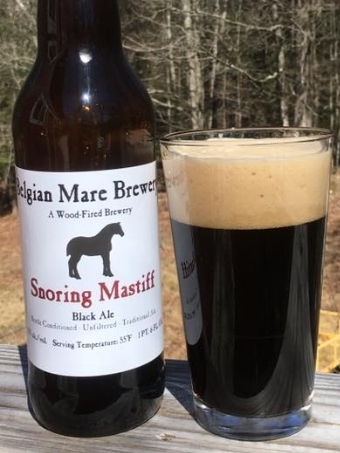 SNORING MASTIFF is a traditional stout. Black as night with roasted grain character. VBL is a lager aged in virgin Missouri oak barrels. Our CONTENTED HEN is a farmhouse ale aged in oak barrels for a bourbon-like character. NARRENSCHIFF gives you a multi-layered taste experience. NARRENSCHIFF: A robust ale made with dark wheat and dark honey, then fermented with German ale yeast, for a multi-layered taste experience. Remember our traditional English “real ale” style lightly carbonated ales are best consumed at 55°F for full flavor!